The moment of stepping on the train in Beijing was momentous. It was the moment where we recrossed our path from September last year and started making progress towards Hyde Park again. There would be no more weaving back and forth round the deserts and mountains of Asia. It was time to head home. The train groaned and grumbled North through steep valleys lined with frozen rivers before emerging onto endless white Mongolian steppes dotted with solitary gers and fur clad herdsmen. From there we finally crossed into Russia and turned West towards Lake Baikal. We knew it was getting colder outside because after Ulan Batuur whenever we flushed the loo out onto the tracks below a frozen cloud of steam erupted through the pan. Luckily, the cabins were as warm as the hospitality of our Russian companions who welcomed us in for smoked fish in their compartment as we saw the first glimpses of the lake. Sergei looked intensely at me and said simply, 'What do you think of beer?'. Unsure about the depth of response this question required I simply nodded, at which his face erupted into a huge grin and he brought over 2 large bottles that were dispensed into jam jars, coffee mugs and medicine measuring cups to toast our travels and imminent marathon. Getting off the train in Irkutsk to meet up with Tim, Eoin and Grainne the breath was knocked out of us. The thermometer read -15 degrees centigrade and the cold stole the heat from toes, ears, noses and fingers with terrifying speed. Not only did the frozen air take our breaths away but so did the fact we appeared to have stepped into a James Bond film – full length fur coats, fur hats, long slick hair, big make up and 6 inch stilletho heels seemed to be the norm for every woman on the streets of Irkutsk.After being surrounded by small Asian people for 6 months seeing tall white people everywhere was a shock to the system. It took a good 12 hours to stop thinking we must know these people or they must be able to speak English, just because they had the same faces as our own. We boarded the minibus to Listvyanka on the shore of Lake Baikal with high spirits, but a suitable undertone of nerves. The ice marathon was in 2 days time. But signs were good when we arrived at the lakeside resort. We were shown into a traditional Siberian wooden cottage with newly stoked wood burner, ancient Soviet kitchen and bedlinen, frozen (broken) toilet and it's own banya complete with sticks to beat yourself with as you sweated away. You realise that when the weather is this cold, you need to do heat well. We could have sat around in our pants it was so warm and Alexandrey's mother regularly bustled in with more wood to ensure we were toasty. 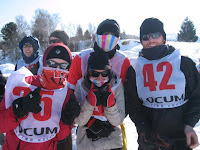 The day before the race we briefly ventured onto the ice to try out our gear. Layer upon layer of clothing to cover as much skin as possible. Thermals, fleeces, windproof jackets, neckwarmers, balaclavas, hats, multiple socks. 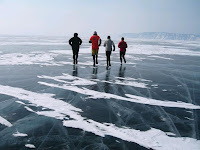 Luckily the Yaktrax shoe grippers seemed to work a treat and we jogged across the sheet ice feeling pretty confident. Seeing the people hacking triangles out of the metre thick ice to go diving simply confirmed this was a place for lunatics. It also didn't take long to realise what an epic undertaking this was. Crystal clear sheet ice spanning into the distance as far as the eye can see until it meets a frosty blue horizon is one of the most breathtaking sights of the trip. The briefing the night before was the chance to meet other competitors and was everything we could have hoped for. The event was managed by Alexei; a mustachioed Russian who had the perfect balance of folklore, impatience, wry smile and respect. He would say things like 'Baikal living animal, we can never know what will happen' and explained how 'many earthquakes every day' and so 'often some cracks. Just use common sense rule'. The mostly rather serious German competitors alternately huffed and puffed at the lack of fixed info, with Alexei unmoved. On discussion of the weather he explained they consulted 5 very technical weather stations, but also, 'some special people in village who come out of house, look at sky and birds and make good understanding'. -15 degrees and clear skies were to be the order of the day. Alarmingly though he did mention that there would be around a foot of snow on the far side of the lake where we started. Next morning all feeling pretty good and with the promised beautiful clear day. We all downed a shot of frozen vodka and then 5 hovercrafts took us over the ice to the far side of the lake. We soon began to realise quite how big the lake is. 646km long, 1647m deep and it holds one fifth of worlds fresh unfrozen water (more than the five Great Lakes combined). The hovercrafts set off on sheet ice on the finish side, but gradually patches of windswept snow built up. Everyone gradually went quieter and quieter as we had been thumping along for over half an hour and had not even reached halfway yet. By the time we got to other side I hopped out to have a final pee and sunk more than a foot deep into the snow. I stumbled, sinking deep into the snow over to Hol only to see that she was casually stood on top of the unbroken crust. Bugger. Back in the hovercrafts to keep warm we wait for 30 minutes before being cajoled out of warm jackets and heated cocoons for 40 or so people line up. Alexei stood up and rapidly explained that 'Caterpillar was meant to crush snow track for running. It broke.... GO!'. A brilliant strategy to stop people complaining, and soon a line of people is strung out ahead. Incredibly, some runners managed to go sprinting off, but I was left slipping and sliding in the thick snow and suddenly it dawned on me quite what we had got in for. I had a nice race plan to try and get to half way (21km) feeling within myself and then press on the for the second half and see what happens. However, the thick snow put a halt to any hope of that as my legs ached, my lungs struggled for breath and it took what felt like an age even for the first 5km marker to come around. Quickly, I went from thinking of putting in a good time to just finishing the race. Eoin was in the distance seeming to skip over the snow with elven abandon, and I also waved Tim off ahead as I knew I had to get some kind of pace I could last at. Suddenly, my head was filled with questions of ruining my knees for the ride home, worrying about how Hol would cope behind me, whether I should just do the half marathon. The impossibility of getting any kind of rhythm had caused any confidence to evaporate in a puff of frozen breath and the last 4 weeks of no training seemed foolhardy. 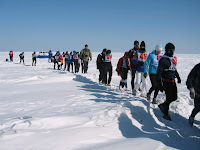 I set my sight on the next food stop at 14km and slipped and stomped onwards as the competitors spread out around me. By the time I had got to 14km and the second feed station I had settled on just completing the race and so stopped for longer for some strong black tea, energy gel and dried fruit. Feeling a bit merrier after that I aimed for half way which came around all too slowly. Luckily the snow begun to thin and patches of ice began to make the going easier. Jogging painfully into the half way point, the women in the hovercraft looked alarmed and another competitor started taking photos of me. My face felt pretty slow to move and like it was made of honey that had been left in the fridge. I looked in the hovercraft mirror and saw it was covered in ice. My nose had a large stalagmite of snot hanging from it and my right eye was pretty much frozen closed. She made me painfully wipe it off with a hanky and I plodded on. A few km later though both my quads seized up over the course of ten painful steps. Crouching exhausted and alone on the ice in the middle of Baikal was a memorable moment. Nobody else in sight, the ice stretching off in all directions. I looked down through a metre of crystal clear ice riven with cracks and there is just an incredible deep, deep blue below. As if to salute the moment, the ice suddenly makes a huge booming, splintering groan beneath me. Alexei had explained that cracks can appear at any time. I wasn't about to hang around to test him. I got up and started stomping/power walking and trying to swing my arms to keep blood in them. With knees unable to handle more than around 75m of running without seizing up, there was little I could but stomp on. With 14km to go Hol whizzed up in a hovercraft with a beaming face having finished the half marathon. It made me feel so much better to know she had done it and was safe and warm and, judging by her face, very happy. What a legend. How many people would come out here and do this kind of thing with their other half I pondered as she zoomed off again to the finish? I'm a lucky man. Grainne, she came 3rd in the half marathon!!!!!!!! What a result. Her knee had been almost unwalkable on for the last few days but running through soft snow must have done it some good and it decided to fix itself from the start line. This was such a relief that Hol pretty much smiled the whole 2 hours 59 minutes of her race. Eoin had come 4th with top foreign finisher in 4hr10m, Ginger had come in at 4h50m and I had struggled in in 16th place at 5h14m. Humbled, broken and vomiting it felt like we had all done something pretty special and that Siberia and Lake Baikal are things to respect. The rest of our time in Listvyanka was spent wandering the town's street eateries and loving Siberia. 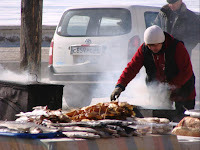 The fresh smoked omul fish with cold beers, giant shashlik kebabs and multiple bottles of Baikal vodka all got taken down with a hunger worthy of our recent exploits. 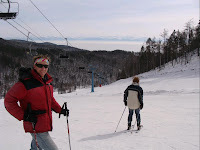 We even squeezed in some skiing for an afternoon on perfectly snowy and empty slopes overlooking the lake. The atmosphere in the town was all the better as it was a national holiday. The Russians at play have a great set up. Wrapped head to toe in warm furs, hats and jackets they filled their time having giant outdoor picnics, towing each other round the icy lake in their cars, drinking, ice skating, doing doughnuts in their hovercrafts and generally enjoying the finer things in life. There have been so many brilliant moments of surreal Russian life. Just snapshots of exactly what you imagine the country should be like. Hey guys. This is James and Brian sitting in Napolean hostel Kitay Gorod, Moscow. Well done on the race, the hypothermia sounds a bit daunting and the photos are awesome. We're both off to the airport tomorrow morning so We hope you have a great time when you get here.